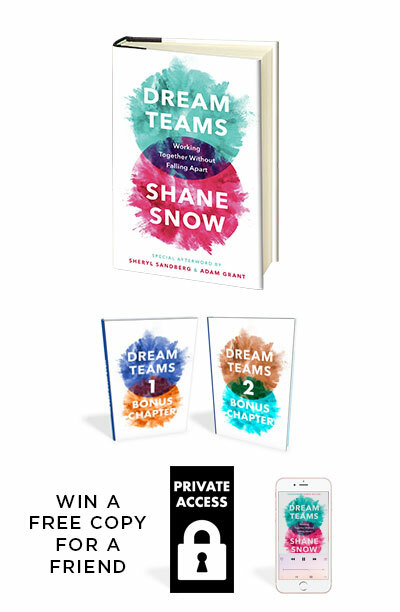 Order Dream Teams for yourself or your team before June 5 and get the following free bonuses! To get this deal, just order from Amazon, B&N, or your local bookstore then forward your order confirmation to karina@shanesnow.com! Order Now and Get the deal! Order now and get this deal! And I'll send you an exclusive invitation for one person from your org (and a +1) to come to the red carpet Dream Teams launch event in June in NYC with me, a renowned cocktail chemist, and some surprise celebrities! If you pick up copies of Dream Teams for your college or grad school class, I'll do a 45 minute guest talk or Q&A with your group—in person if you're in the NYC area, or over Skype if you're somewhere else in the world.